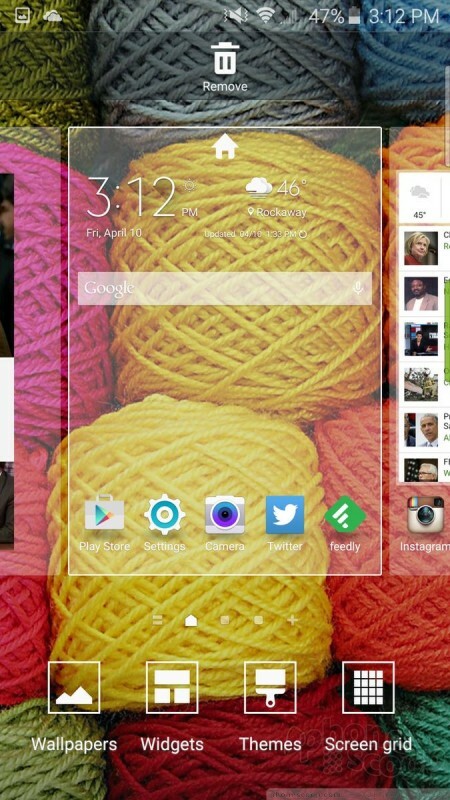 The S6 Edge includes support for Samsung's split-screen mode, which allows two apps to function in separate windows at the same time. It's fairly easy to activate, and a decent number of apps work with the feature, such as the browser, Gmail, YouTube, messaging, and so on. It's a cinch to drag content from one live window to another, and otherwise interact with the multiple windows. This is a useful feature I wish more smartphone makers would adopt. 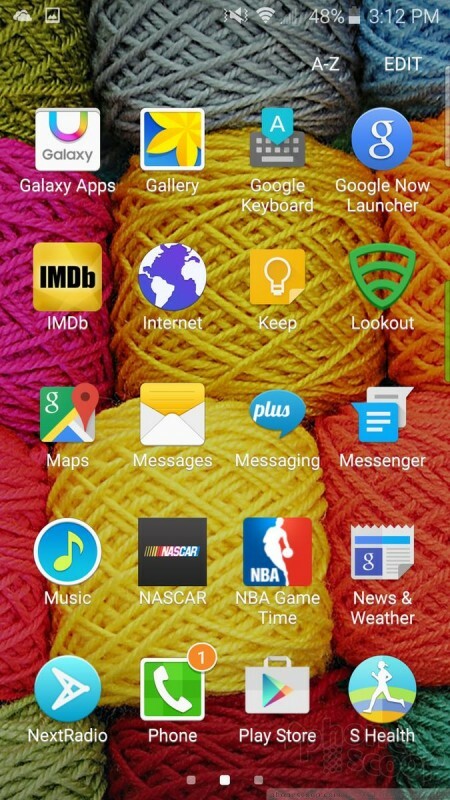 The Edge offers Samsung's Easy Mode, which dumbs down the user interface for beginners. 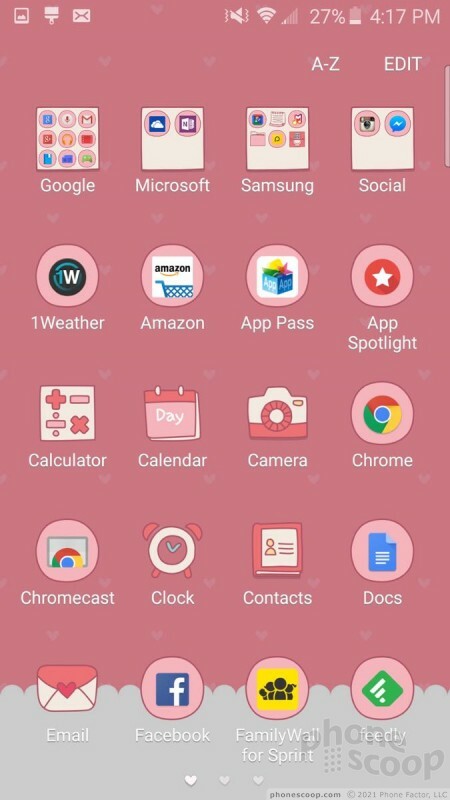 It's no doubt useful for people who might otherwise be overwhelmed by TouchWiz, but for goodness sake buy something cheaper if you need to use Easy Mode. 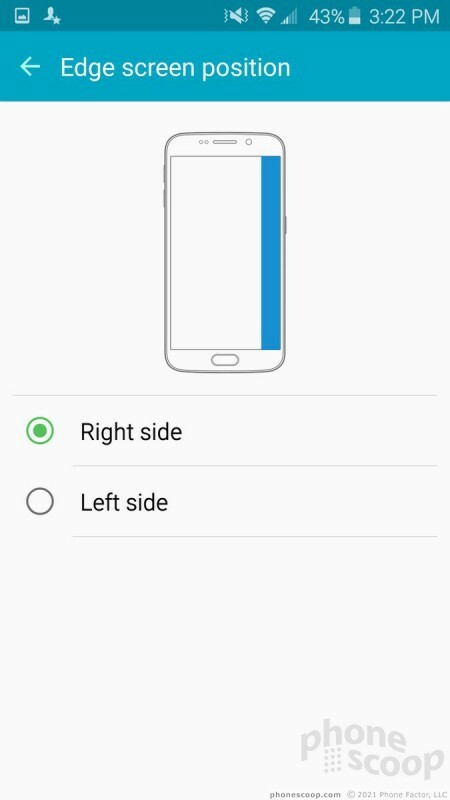 Last, you can choose to put some content on the left or right sides of the curved screen, but not both edges at the same time. There's a simple-to-use control panel in the settings menu that offers a handful of info strips that run down the edge of the screen. 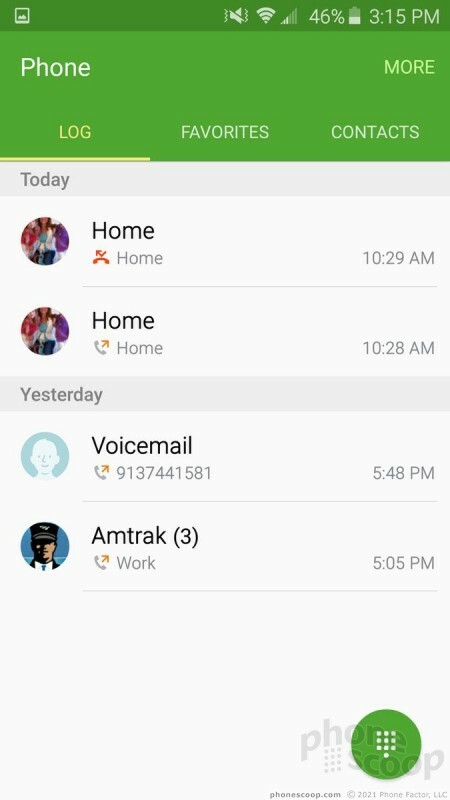 For example, there's one that shows missed calls and messages, another that streams Yahoo headlines, one for Twitter and so on. These info strips don't stay on indefinitely. They come and go when new content hits them. 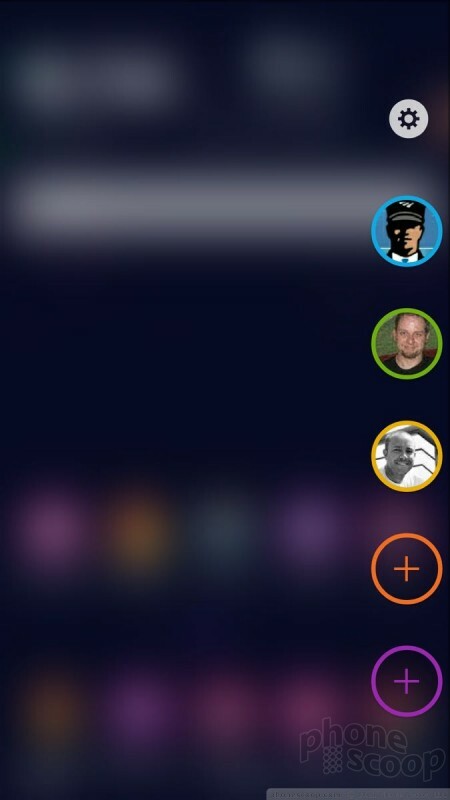 You can have several of the strips active and swipe through them to see the different alerts. They are only accessible when the display is off. In order to view them, you swipe from the edge of the screen toward the middle. The content can be refreshed if you pull down on it. If you tap the content, it will open the associated app. A few words about performance. Samsung kicked Qualcomm's Snapdragon processors out of its premium device in favor of its own Exynos-branded chips. The Edge has an octa-core processor with four cores at 2.1GHz and four cores at 1.5GHz in a big.LITTLE configuration. The processor is paired with 3 GB of RAM. After spending a week with the phone, all I can tell you is that the device is hella fast. It does everything in a blink. It's Mario Andretti meets Mario Kart. 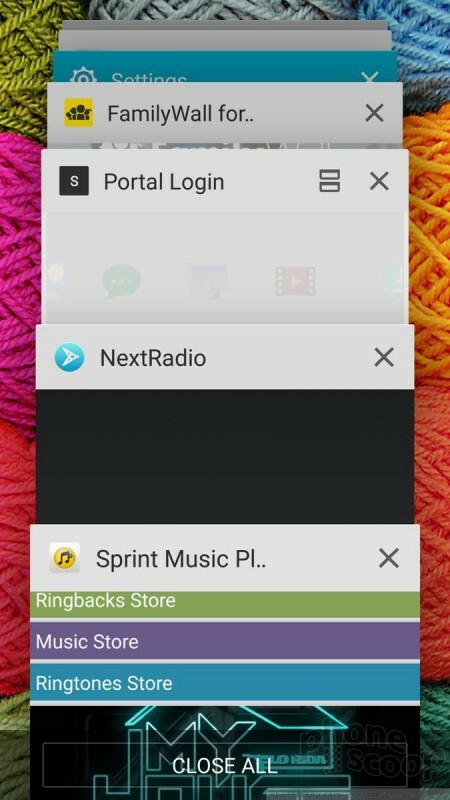 Samsung's phone app is a slight variation on the Lollipop phone app. 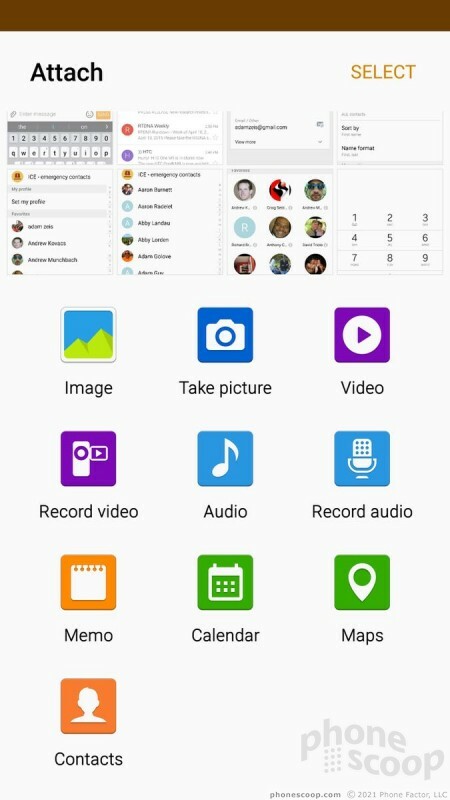 Samsung's app easier to use, in my opinion, and looks better too. 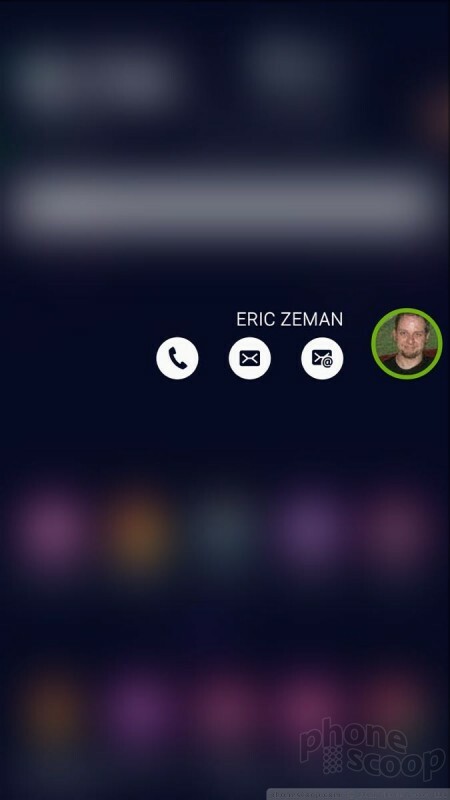 The default screen is the dialpad, but tabs across the top will take you to your call log, favorites, or contacts. In-call options run the norm. 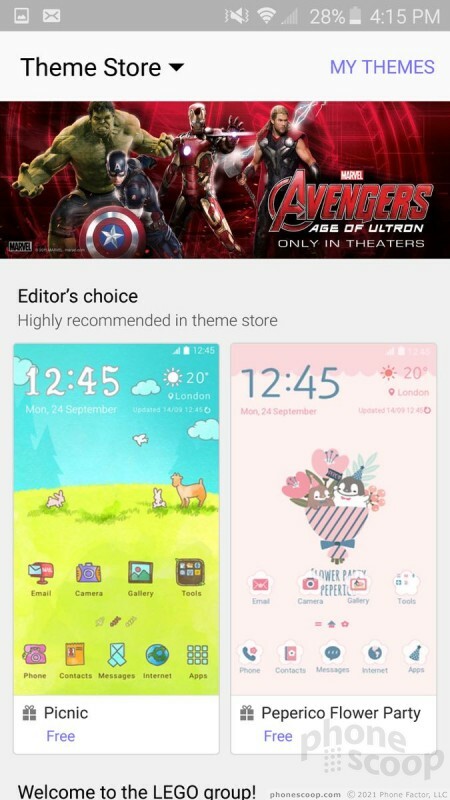 Like most Galaxy-branded handsets, the Edge offers extensive control over the minutia of the phone app. For example, you can define call rejection behaviors and whether or not it automatically sends text messages. 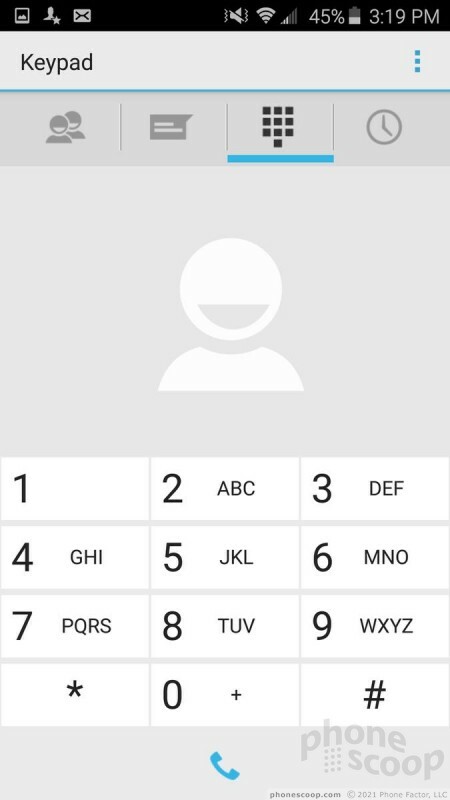 You can choose to automatically reject all calls from select numbers, how the phone answers calls (press the home button, using voice commands, etc. 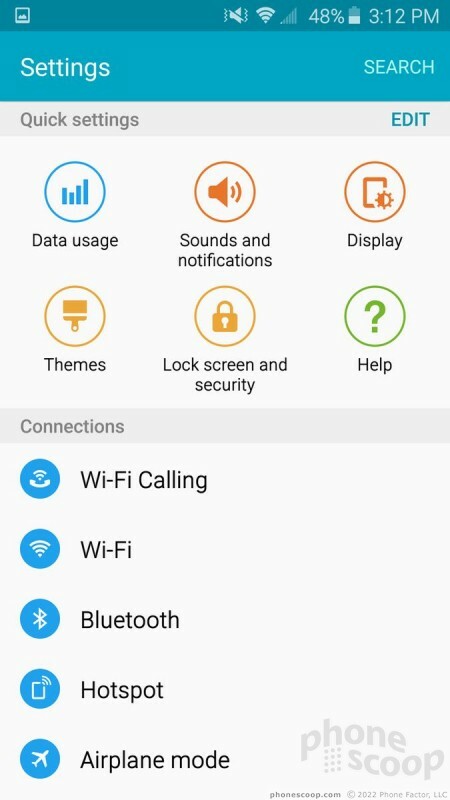 ), and even automatically answer all calls when connected via Bluetooth. Because this is a Sprint phone, it also includes WiFi Calling. Call quality over WiFi was indistinguishable from call quality over Sprint's cellular network. 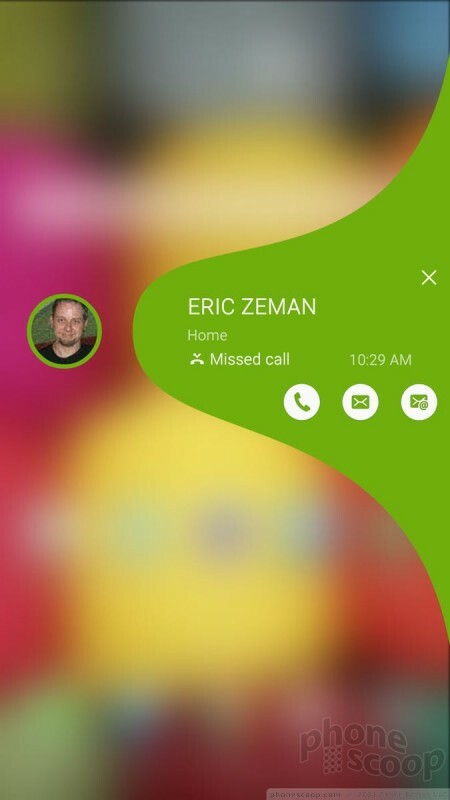 The contact app is practically the stock Android version. Samsung gave it a fresh coat of paint, but otherwise it functions as we've come to expect. 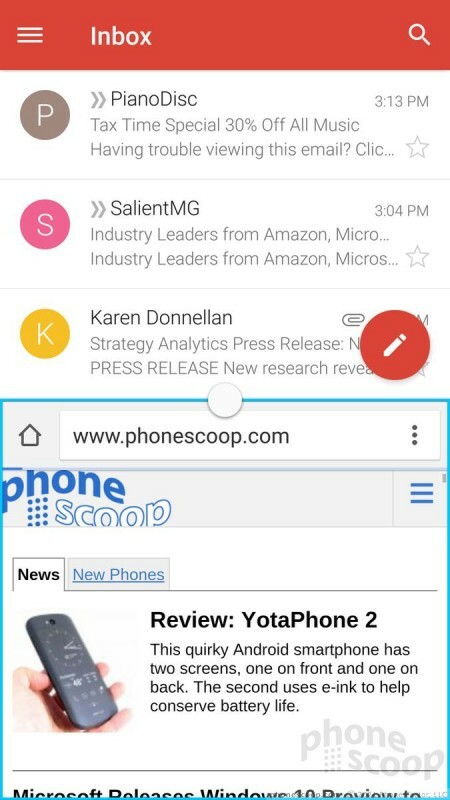 When you open the actual contact app, the default view is all contacts. There are tabs for reaching your favorites and/or groups. 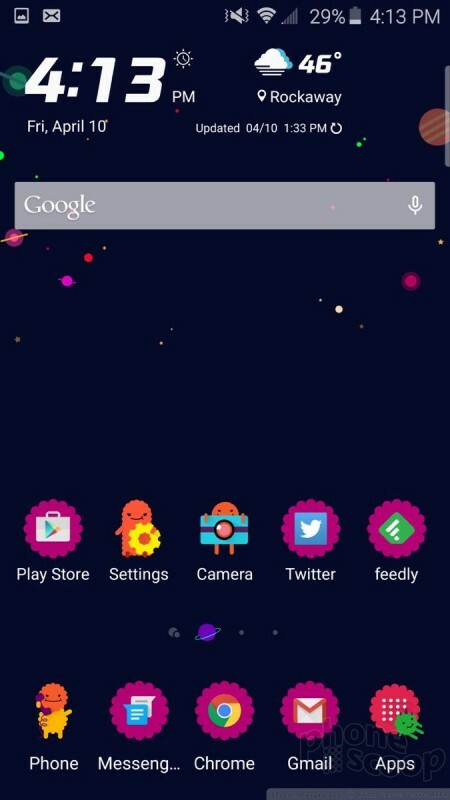 All the graphical elements are fitted into colorful circles and its certainly bright. 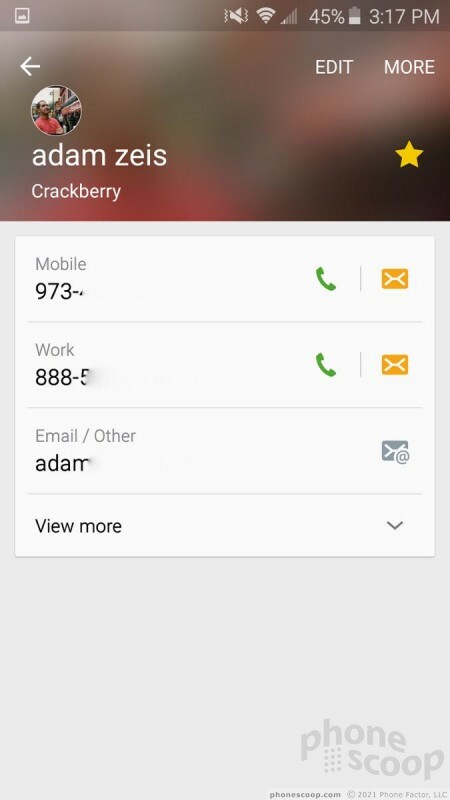 Individual contact cards hold tons of data these days, and the phone can easily sync with pretty much any internet-based contact database (Gmail, Outlook, Yahoo, Exchange, etc). You can also also merge your social networking contacts into the fold and even choose to view only your Gmail contacts, your Facebook contacts, and so on. 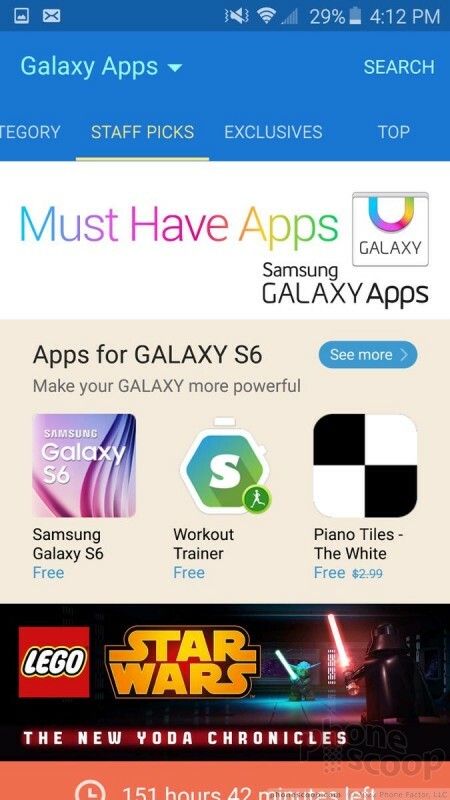 These two apps present one of the Edge's neatest tricks. 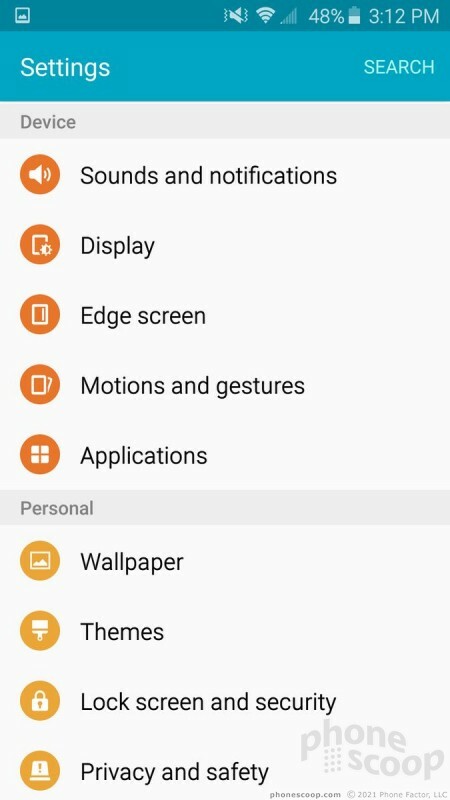 There's a tool for the Edge Screen called People Edge. 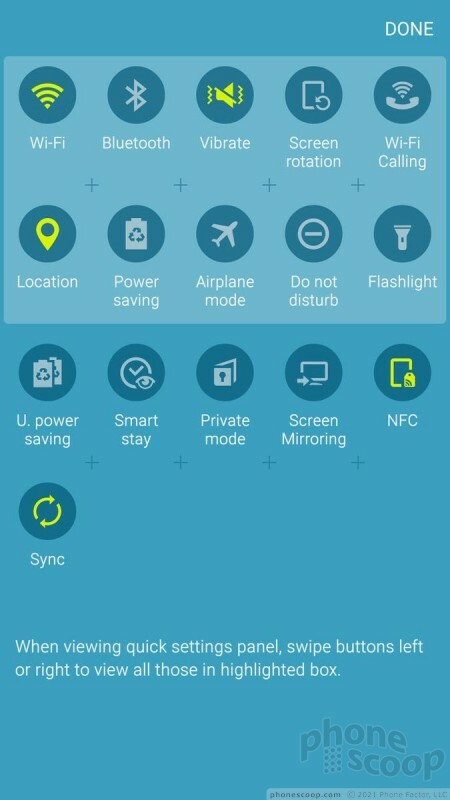 Turn it on (in the settings), and a little bar appears on the edge of the home screen panels, close to the top. 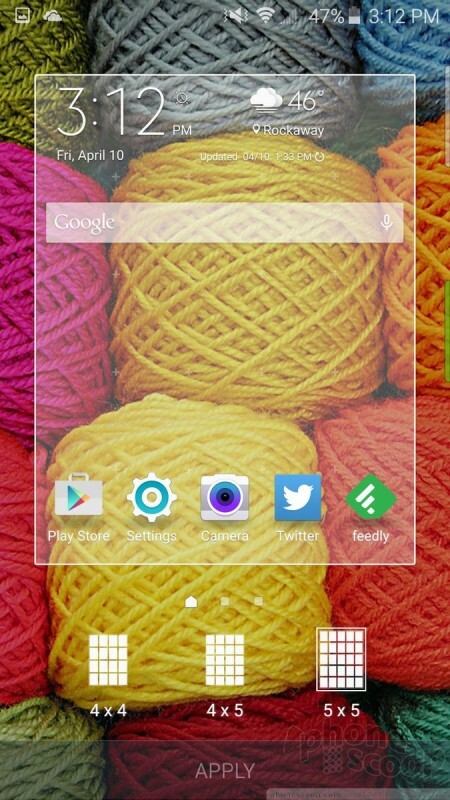 Swipe the little bar and the Edge Screen will open and show you five colored circles. 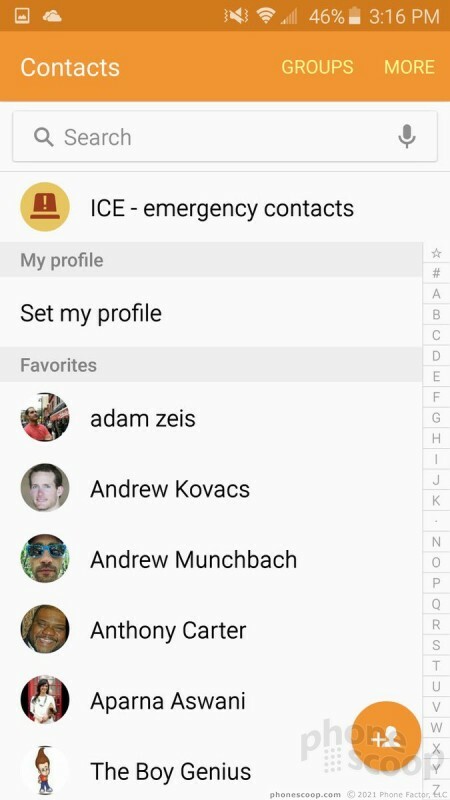 Assign up to five of your favorite contacts to these circles. Let's say you put your mom in the red circle. From now on when mom calls and your phone is placed screen down, the side edges will light up red when the phone rings, creating a red glow where the curves face the table or other surface. This way, you'll know who's calling from afar. Further, if you've missed your mom's call, a little red bar will appear on the right side of the screen. 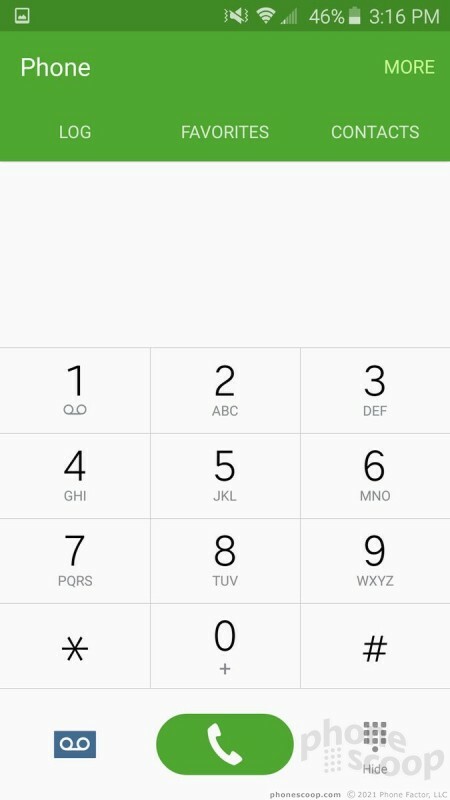 Swipe the bar, and the Edge reveals the call details and includes shortcuts for calling or messaging. 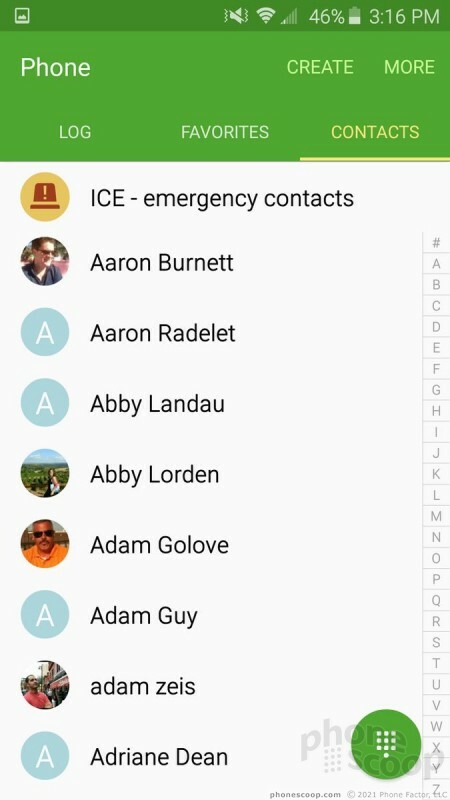 You can also swipe open the People Edge tool any time (from the home screen panels only) and use it as a shortcut for calling/texting these five contacts. It's pretty cool. 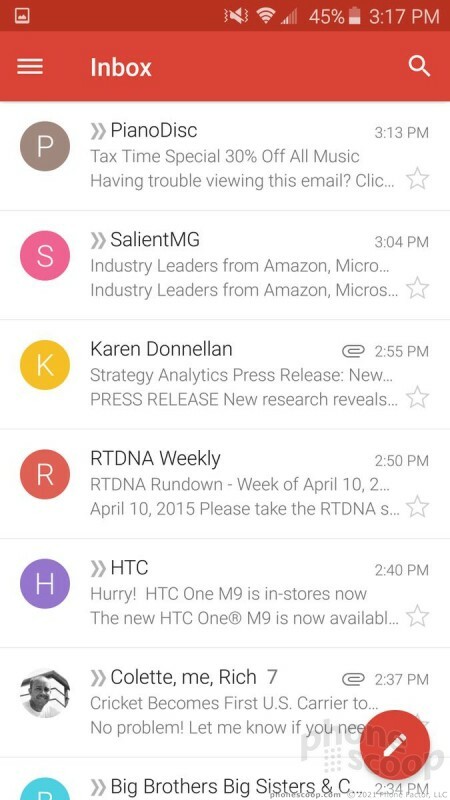 Gmail is on board, as is the no-longer-relevant email app. Gmail handles all types of email accounts these days so the email app is just a waste of space. As far as text messaging goes, the Edge includes the older messages app and Messaging Plus, which is a third-party app for handling SMS. 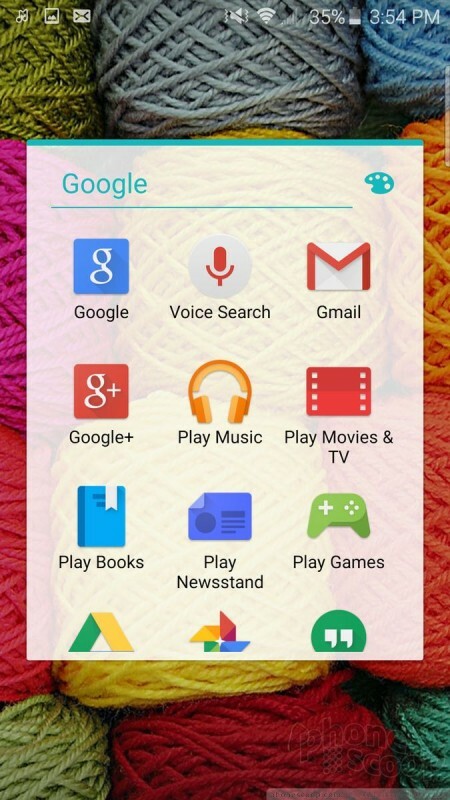 I don't know why the newer Messenger app (SMS) from Google isn't on board. 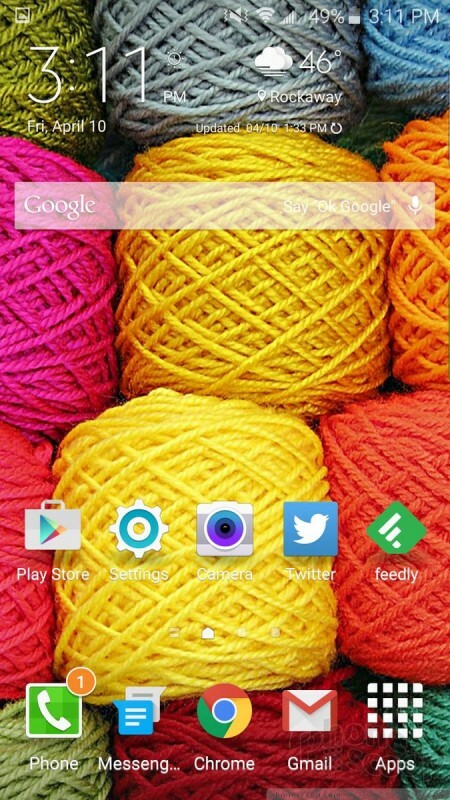 The Edge also has the Hangouts app, which handles SMS and IM together, if you wish. 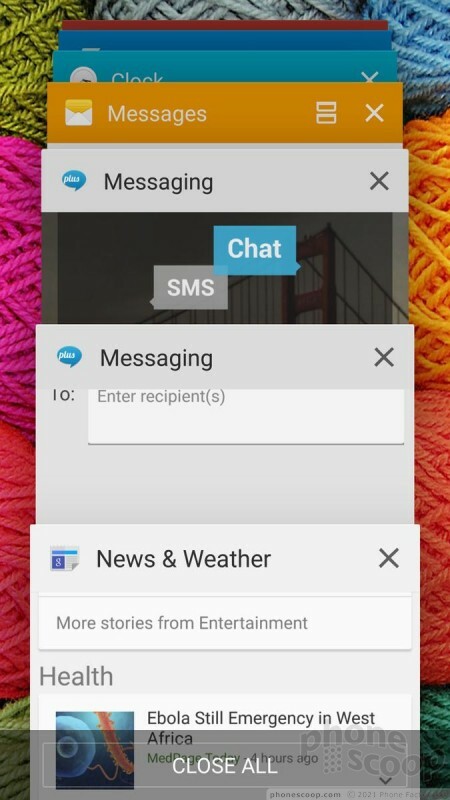 Let's not forget Facebook Messenger, as that's pre-installed, too. Last, there's Sprint Family Wall, which is a shared messaging space for family plan members. 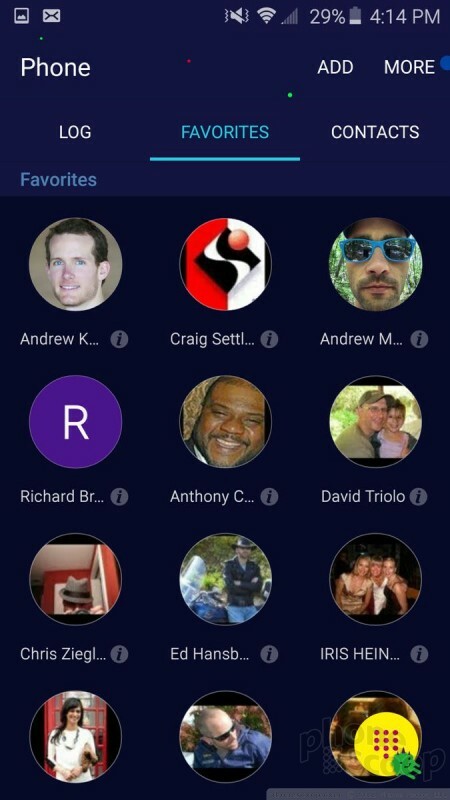 It lets people share not only group messages, but also calendars, photos, and files. 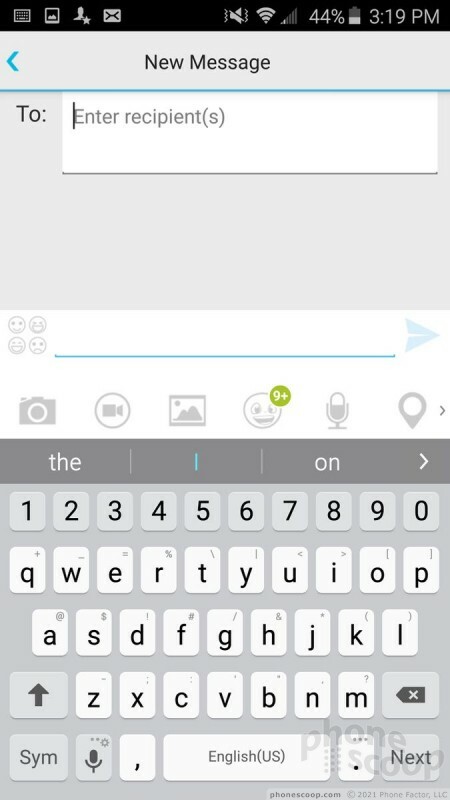 For families, this might actually be the most useful messaging app of the bunch. The actual Facebook and Twitter social network aren't pre-installed, but you can be sure Google+ is (ugh).